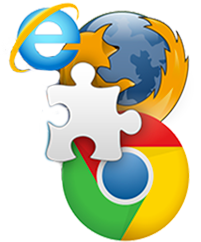 Ever Wondered About Browser Extensions? Answer: “A browser extension is an add-on or plug-in that extends the functionality of a web browser.” Wikipedia A browser is “is a software application for accessing information on the World Wide Web,” such as Chrome, Firefox. Safari, Internet Explorer, Edge, and the list goes on. Wikipedia There is some debate as to the difference between a browser extension vs a plugin but we leave that for another post on whether the semantics really matter? What are the more popular web extensions? Answer: 1Password, Adobe Acrobat Reader, Microsoft Silverlight, Java Virtual Machine, AdBlocker, Google Translate, Feedly, Hangouts, Avast, Evernote, and list goes on. You may have at least heard of one of the more popular ones in this list. What the extension does is extends your browser beyond its built in functionality. For example, the Google Translate extension allows your browser to translate a web page from one language to another on the fly. What should you know about browser extensions? If you are confronted with making a decision about whether to use a browser extension with your favorite browser you should understand that downloading an extension or plugin may cause some concerns. For example, extensions are notorious for slowing down your device or may install malware. So it is extremely important to be cautious of any web site that asks you to download an extension or a plugin to ‘improve your experience’ or enhance your browser. Be sure you TRUST whoever is offering you this download extension. Quickly assuming that you want this extension or plugin can later prove to be a disaster that you may regret. We find that many of our customers install “Smart Search” plugins and other questionable or outright malware and adware plugins inadvertently—often thinking they’re installing something beneficial. Sometimes a plugin will come bundled with some other purportedly useful app. We recently posted an article, Google Cracking Down On 3rd Party Browser Extension Installs, because Chrome is currently the world’s most popular browser and offers more extensions than other browsers. Google is working to tighten up the security of downloading an extension from the Google Play store. Apple also does a very good job of curating the extensions in their Safari Extensions website and is soon to be moving extensions to the App Store. By acquiring the extension from the Apple or Google websites, you’re definitely better protected than you would be if you simply download from a random website from a vendor you may not know or trust. When you download an extension you have to give it permissions. When you do, you may be giving out “the keys to your kingdom”. So you need to pay attention to the permissions that extensions require. And when you get a notice from an extension asking you for a new permission don’t just casually give permission. Know precisely what permission(s) you are granting. It is possible that when you install any app or extension that it may have malicious code that installs on your device or gains access to your privacy. The solution is to acquire not have too many extensions, always download from trusted sources, and install a security software watchdog that monitors your device for malware. The same concerns about granting permissions for security apply to privacy which you should be aware of. What permission are you granting regarding your privacy? Lifehacker says, “your browser is probably sending some information back to the company that created it, but that information is explicitly used to support the features you have turned on.” This also goes for the developers of web extensions. So it is important to grant permission to what you want the extension to do for you. Granting your private information may be part of this function or it may not be necessary. You make that decision. Browser extensions need to not be a mystery but something people manage if they bring value and remove if they’re not adding value. If you still have questions or concerns, please don’t hesitate to contact us.